I started the Broadcast Journalism MA course at City, University of London because I hoped it would open many doors and opportunities for me. Still, I couldn’t have imagined it would give me the chance to report on a Royal Visit right on City’s very doorstep. The Duchess of Sussex, Meghan Markle, timed her visit extremely well because it coincided with one of our weekly ‘newsdays’, in which we create a TV or Radio programme with live reporters out on location. As live reporters we didn’t need to go very far to get the money shot. In fact, we pre-empted the Duchess’s 2pm arrival, got ourselves press passes through City’s Press Office, and stood proud on our own turf with other royal correspondents and paparazzi. Despite the somewhat miserable weather, hundreds of students and members of the public lined Northampton Square for the exciting visit. We were allocated a spot in the area of photographers and journalists, with a perfect view of the car pulling into the University. As a smiling Meghan got out of the car and was greeted by members of City, University of London and the Association of Commonwealth Universities (ACU), the atmosphere was electric. Myself and fellow ‘Royal Correspondent’ Olivia Wilson split the all-important roles: while I took photos for an online article, she recorded the atmospheric sound and took a video. After the Duchess entered the building, we focused on interviewing students and members of the public to get a variety of perspectives on the importance of her visit. We then returned to the journalism department ready for our team’s 3pm radio broadcast. 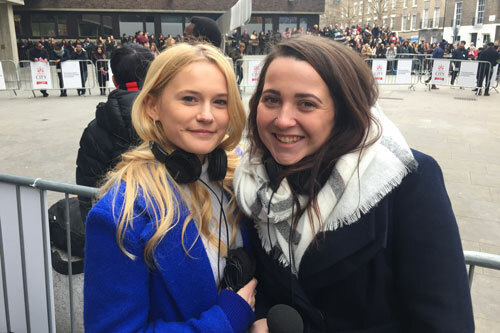 Olivia was brought onto the show to make a live report on the significance of Meghan’s new role as patron of the ACU. Our photos were used for an online article to correspond with the radio news segment. What is good about our weekly ‘newsdays’ is that they mimic real-life newsrooms, roles and pressures to present, edit and produce a real news show to a tight deadline. Thanks to a Royal Visit to City, they have also provided me with a very real and special live reporting experience.